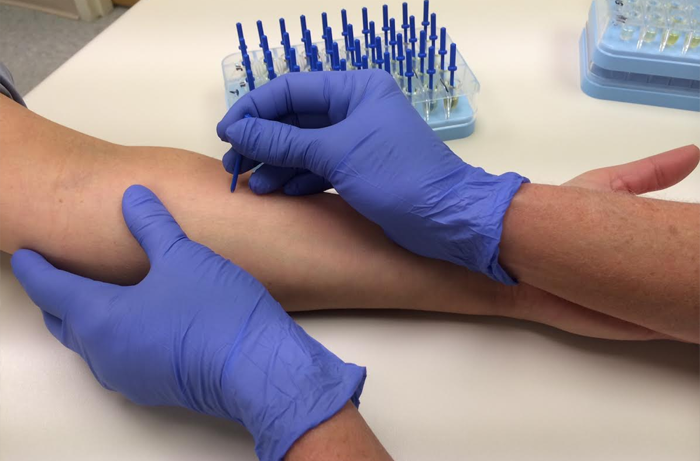 Skin Testing is the most accurate diagnostic test used by a trained allergist/immunologist. The skin is lightly scratched on the surface with a tiny amount of the allergen on the tip of a small instrument, similar to a plastic toothpick. If you are allergic to a substance, a small mosquito bite-like bump will appear which allows the allergist to determine your specific allergy profile. We will test for allergies to foods, dust mites, cats, dogs, feathers, mouse, orris root, cockroach, pyrethrum and the most prevalent trees, molds, weeds and grasses in the area. Receiving allergy shots desensitizes allergy patients to their specific allergens. By gradually increasing the strength of your allergen, your body develops an immunity and/or tolerance to that allergen. With allergy shots, your allergy symptoms can be decreased, minimized or even eliminated and the results can last up to 20 - 30 years. Patch Testing can help determine if you have allergic contact dermatitis or irritant contact dermatitis as a result of a substance that you are coming in contact with. Venom Testing can help determine if you are allergic to stings from wasps, bees, hornets, yellow jackets and/or fire ants. Venom Immunotherapy involves administering gradually increasing doses of venom to decrease a patient’s sensitivity to the venom in order to reduce the risk of a future allergic reaction. An oral food or drug challenge is a procedure where a person takes a particular food or medication by mouth in order to assure that no allergic reaction occurs. Examples of local anesthetics include novocaine, lidocaine and benzocaine. Skin testing can be helpful in the evaluation of adverse reactions to these medications. Commonly tested antibiotics are penicillins and cephalosporins. Natural rubber latex is often found in rubber gloves, condoms, balloons, rubber bands, erasers and toys. Allergic reactions to latex range from mild to very severe. Skin testing can help determine if an allergy is present. Examples of vaccines include MMR, Varicella and Influenza Vaccine. Pulmonary Function Test provide measurable feedback about the function of the lungs by determining how much air your lungs hold and how quickly you can move air in and out of them. Please visit our New Patient page and complete the forms before you come to one of our offices across South Georgia.